A traditional favorite transformed into a new dessert option with mangos. Remove husks from water and pat dry. In a medium bowl beat together masa, butter, brown sugar, baking powder and cinnamon until fluffy. Beat in nectar until smooth. 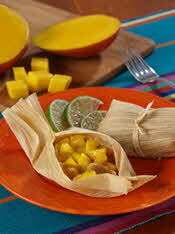 Spread equal amounts of mixture in the center of each corn husk; top with 2 tablespoons chopped mango. Bring in the sides of the corn husks so that the edges of the masa meet, then fold in both ends to enclose filling. Steam for 1 hour, then let cool slightly. Combine 2 TB orange liqueur or orange juice, 2 TB brown sugar, 1/2 tablespoon butter and dash cinnamon in a small saucepan. Cook over medium heat for about 5 minutes or until slightly thickened, stirring frequently. Stir in 1 cup chopped ripe mango (about 1 mango) and cook for a few minutes more. Serve warm sauce over warm tamales with lime wedges on the side.